Great news is that Western Greyhound will be operating a 3 day 'Herritage weekend' from Newquay tomorow, Saturday and Sunday!! This has been popular in previous years and will use a variety of the Western Greyhound Herritage fleet with not a Vario in sight!! 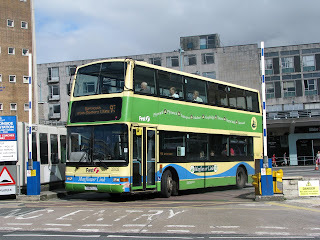 Buses that are going to be used are first and foremost the last remaining Bristol VR JWV 259W. There will also be Routemaster RM 1062 62 CLT, the one preserved in the red livery unlike the other Routemasters. 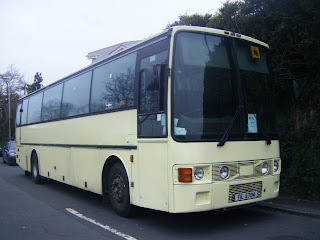 And lastly AEC Regal 4 MLL 528. The normal tickets will be avalible on these services including the day riders being £7.00 for Adults and £4.50 for children. The listings for the buses being operated are shown below though do be aware that these have changed a couple of times throughout the course of the week though these are the latest. Saturday definately looks like the hot day to be down there! Please note: due to Obby Oss Day in Padstow services may be subject to different timings. 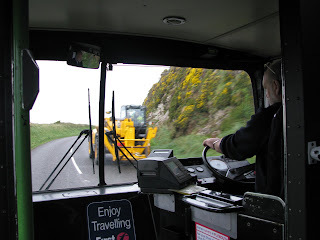 1635 - Service 556 - Padstow to Newquay. 1615 - Service 586 - Truro to Newquay. 1815 - Service 586 - Truro to Newquay. ... in posting blogs about K802 ORL. Well here is a note to say that 34002 has again returned to Torpoint and has been seen on school duties throughout the week from Cremyll. Tridents have also been used because of the current route diversion which is due to finish at the end of the week. On Monday in Cuffy's usual sarcastic manner he goes to me "There's a Tally Ho coach goin round at the moment". I must say I took this as one of his normal jokes though actually this was true! While coming out of Millbrook in 'Millpool Head' there was a Izitar bodied Tally Ho Scania parked in a very strange place. Cuffy stopped the bus and allowed me to get these two photos of the bus. It looked like it had been on a private hire, though why would anyone from Kingsbridge want to come to Millbrook? Well the day started off uneventfully for a change for the run into Plymouth on the first bus of the day, this sadly being 40002 the Torpoint Dennis MPD driven by a bloke who's nearly as good as Jamie Limb! The 08:52 was again an uneventful jounrey upto Exeter. This was only £1.50 because we booked in advance. Though as we needed to go back to St Thomas, and this was only 45p return!! The only problem was the frequency! It was over an hour wait to get a train back so this meant a walk back to the station. We then waited for the connection to Okehampton. A choise of 3 services was avalible, the X9 run by FDC with Enviro 400s, the 510 by Western Greyhound with even newer Enviro 400s or the X90 run by Hookways with some nice oldish B10Ms. The first bus that turned up was the 510 though to be honest this was no contest. We hung on for another 10 mins in the pouring rain to have the liberty of a ride on a FAR SUPERIOR Volvo B10M in the form of L948 CRU. This was a very enjoyable blast along the A30 and even though we left 15 mins after the Western Greyhound we still beat it by around 10 minutes. This therefore making the X90 25 mins quicker than a 510. And you get there in a lot more comfort! We then met up with Cuffy who was on his meal break at Okehampton. He showed us where to get a good pasty, while we waited until we could take over the bus. We took her over dead on time for the run to North Tawton, but with the divertion bit on it different from other services. Then it was a trip back to Okehampton. Then a service round some housing estates. Then a service 'up a hill' then another service to the railway staiton. This was repeated 3 times and we were completely confused by the end. 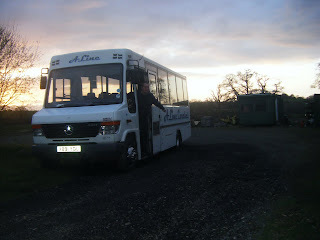 But Cuffy was in control and he kept the very apropriately named "Busy Bus" on task. Along the way there were plenty of photo opotunityies and we had a lot of fun on route. A lot better than I expected it must be said. There is also a fair bit of variety with regular coaches from Hookways, Enviro 400s from FDC and Western Greyhound, Optare Versas from Beacon bus, Solo from Carmal along with Varios, and Stagecoach with some Volvo Olympians! After we'd finished it was a drive down the A386 in Cuffy's Astra, a mode of transport I have not used for a long time I must say! Then it was about an 1hr and 15 min wait for me in the city centre until the 19:56 81C which aparently according to the realtime display goes to "Innsbrooke Road" better known to everyone else as "Insworke". 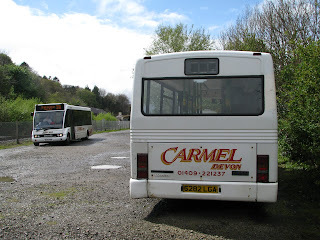 Sadly this bus also goes round Goad Avanue and then also extends to Crafthole. And even worse it was the Dart!!! Sorry about the lack of posting this week but it has been very hectic with a lot of work to do first week back at school, and several loads of coursework, the deadline being very soon. Anyway to work and to kick off I have made this video of the divertion in Millbrook running this week and next week. First video is of Jim showing how it should be done, with no mishaps along the way. The next is of Derrick Cuff, showing that this diversion can cause big problems while on route! Well my comment on a '54' reg Vario at Countrybus is slightly wrong! I am not actually sure if this is new to the company but what I thought was a 54 was actually X532 AAV which is one of two of this batch at Countrybus. Torpoint's newly refurbished Mercedes Vario 52529 has seen at Plymouth Railway Station with major smoke coming from the engine bay. The picture and video below shows it pouring out from underneath the bonnet in every gap possible. 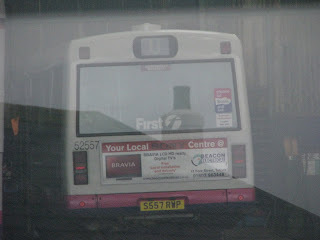 Though the new driver then said to me "Your not allowed to take pictures of this bus". I then said "Why is that?" he replied "Your not allowed to take pictures of this company" so I said to him "Well I have been taking pictures of First buses for 5 years now and I have never had a problem, has something changed?" He then proceeded to close the doors. With smoke still coming from 52529 he started the Vario up and drove away, though I doubt he got very far. The smell was also quite bad so will be interesting to find out what happens! The day started off very well! Dave turned up with Leyland Olympian C417 HJN which was a great change from the usual Trident on the service. Though along Witsand Bay it did seem that everything was against us getting to the other end! 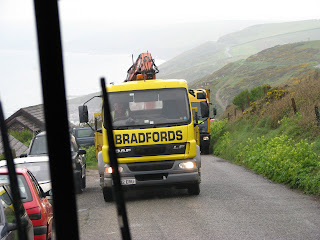 Firstly this Bradford's lorry was unloading building materials completely blocking the road. This was then not helped by a rubbish lorry queueing up the other side! Though after a few minutes we navigated our way through. Secondly was this tractor parked very obscurely which was a challenge to get past. And then this forklift/tractor got in the way as well! When we were together we got into the station to get the tickets! 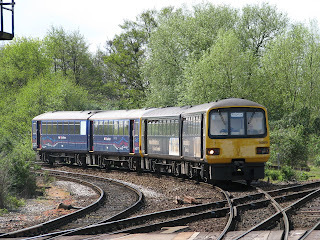 The Devon Day Ranger is what we always go for now offering all day travel across the Devon rail network including branch lines for just £5. We even got our names printed on them as you can see!! We made our way upto Newton Abbot, then onto Exeter. To Exemouth and then back to Exeter. From Exeter upto Axminister. Then Axminister all the way back down to Newton Abbot. The Newton Abbot back to Plymouth. Several interesting things were seen along the way! 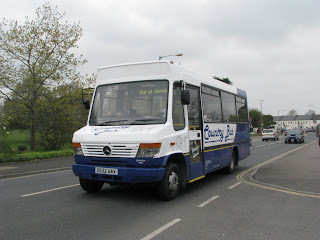 Firstly was that Countrybus now own a 54 plate accessible Mercedes Vario which has now seemed to have replaced the Accessible Mercedes 811 previously seen on this route in Newton Abbot, I haven't yet got a picture though will get one in the near future! 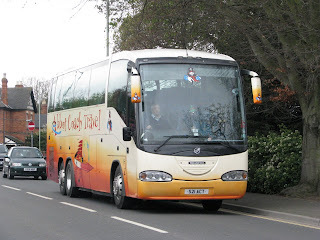 Next was Abbot Coach Travel's Scania Izitar S21 ACT seen at Newton Abbot. Another very impressive Tri Axle coach. Next interesting thing was in Exeter. I hadn't seen this before, though seems to have been in Exeter for a little while now. 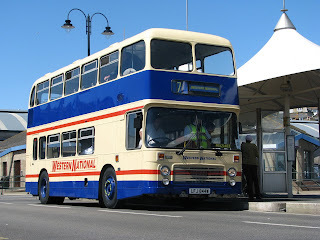 This was J139 HMT a Northern Counties bodied Scania N113. I must say it did sound gorgeous when it was leaving the station. 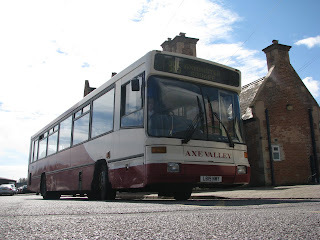 Then in Axminister was Ex Arriva Dennis Lance L819 NWY with Alexander Strider bodywork now owned by Axe Valley. 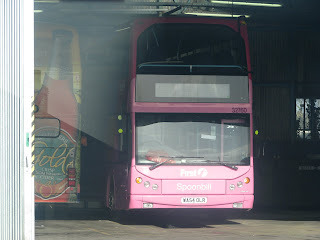 And there was this, S675 AAE operated by First Somerset and Avon. This bus had just come from Taunton. A journey of around 1hr 20mins. And to finish it all off was well more challenging the first expected. Our train had been held at Exeter for a late CrossCountry service meaning we were delayed by around 10 minutes. Though it doesn't sound like much it made all the difference when we got to Plymouth. I dashed out of the station to try and get a bus into Royal Parade as fast as possible. Though a 1 turned up just 5 minutes before my 34 left! He terminated at Exeter Viaduct which didn't help me at all. Having o run from there to the 34 stop in only 1 minute. Though before I even got there it seemed that the bus had already departed towards the ferry. 81C arrived in Cawsand too late from me and was not due for a while. So my only option and 3rd fall back (after the 2 34s) was to get a 3 and run from the Brewery Tap down to the ferry. Though even this failed. 38015 turned up late and we were delayed further as this was not a low floor vehicle. This then meant a 30min wait in Admirals Hard for the ferry to depart! 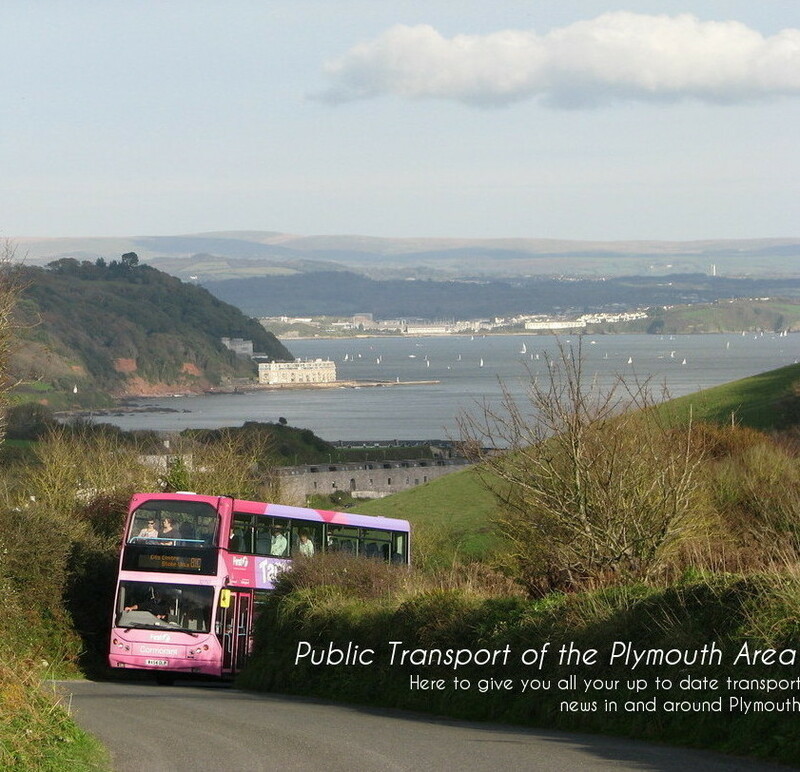 But at least the other side there was a 500 to London waiting for me to get me to Cawsand!! So all in all a very interesting day out!! Bad news came to my ears today after an event that WNPG were attending that I missed. 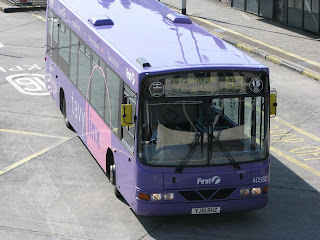 Ex Torpoint Ferrybus LFJ 844W as you know has always been my favorite. Though at pick up from Loddiswell where she is now stored because of FDC not wanting the preservation buses in the depot she was found to have problems. After a little while of trying there was no hope in getting her going. Damage or freezing seems to have occurred over the winter period and she is currently a non starter. The damage may also have occurred when she was being transferred from the depot at Plymouth just 2 days ago when she was running a dream. Possibly run too hard on her first outing for many months? Therefore all WNPG could take to the rally today were 2 cars in the form of Paul's Vauxhall Astra and Mike's Renult Clio. Though no sooner do I mention her than Derrick Cuff sends me a picture of her during her time at Torpoint. This weeks snap on Sunday is of little and large in Cawsand bay. 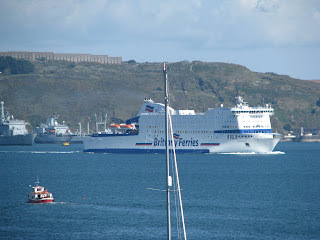 Pictured is Brittany Ferries' Amorique (Big!) with Normag Cruises Weston Maid (small!) passing in the oposite direction. Though I do apologise for the incompitent sailor who parked his mast in the way of the photo. The Cawsand Ferry Weston Maid was back in service today after storage at Voyager boat yard through the winter. She's had the normal minor overhaul over the winter and is running very nicely. 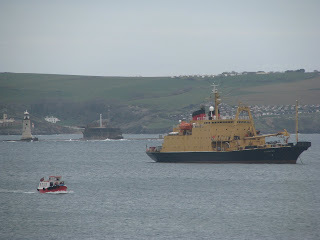 Pictures shows her coming over to Cawsand, pictured next to SD Newton. A picture of little and large in Cawsand Bay!! Mercedes Vario 52557 S557 RWP is still hard at work at Torpoint. For a change though she wasn't on the 181 and I got this admitadly not a good shot of her in the depot and along with C417 HJN. Has been good to note that at least the drivers seem to be taking some care with the Olympians. All three are now nearly always stored in the depot at night unless one is out on a later duty, replacing a Dart/Vario etc. While looking through an issue of the bus trade magazine 'RouteOne' with Derrick we stumbled across this story about none other the First Devon and Cornwall's 34912, 530 OHU. 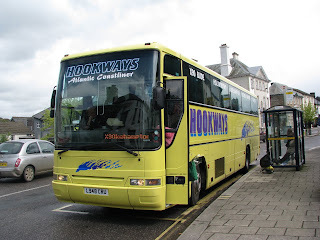 Previously the bus was registered N112 UHP and was bought specialy to run the A1 from London to Heathrow Airport, at the time owned by London United. The story features the wheelchair lifts used on the buses and shows N112 UHP's lift in action. 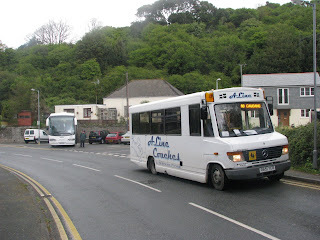 The links below show the bus with First Devon and Cornwall. 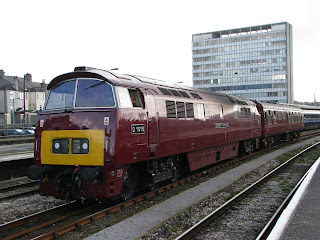 She was used in Plymouth and Barnstaple but is now a runner on the Penzance routes. The last link shows the bus as it was then in the model form. 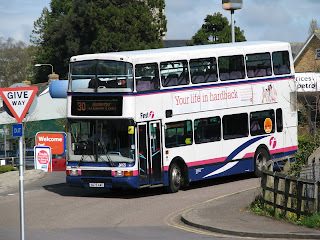 In Newton Abbot yesterday I got my first glimpse of the impressive new 15 metre Volvo B12B(T) / Plaxton 'Accessible' Panther C65FTL tri-axles. This one was privately registered as with all of these new coaches, LSK 835. Though I'm sure these will have problems in the region being this size. The Neoplan's had been doing a good job overall and its a shame to see those decker's go and replaces with the somewhat boring and common Panther body. 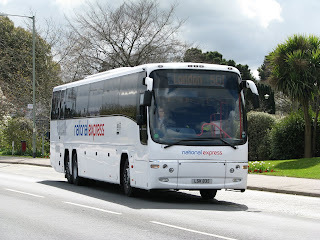 While thinking about this I also wondered why National Express didn't opt to go for the new Plaxton Elite bodied beasts. Those really do stand out from the crowd and if anything is eye catching then those would be! 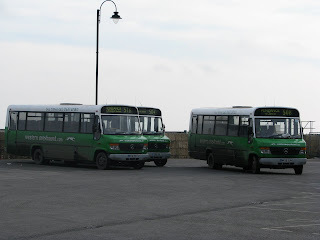 Derrick Cuff has very kindly sent me some lovely pictures of 2 buses that he has been driving last week. 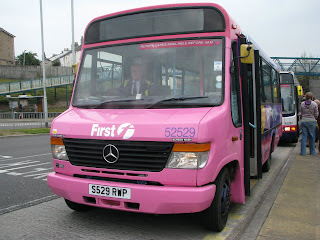 First is A-Line Travel Mercedes Vario X891YGU on private hire duties in North Devon. Second and third are of Girling's TIL 5704 a 70 seater Van Hool bodied beast. 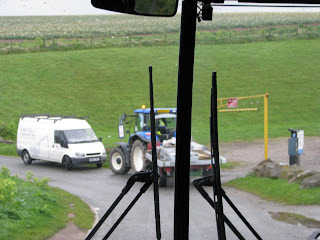 This was used on a school contract from Coombe Dean to prince town. 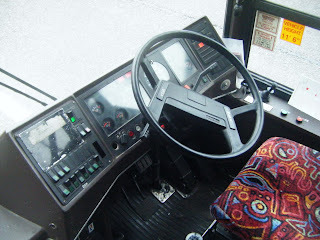 3rd picture shows the cab onboard the bus. Today saw quite a revival of old locomotives across the southwestern mainline. 3 classic/vintage (whatever you want to call them) trains were on a railtour across the region. At Plymouth alone there were around 50 at the station to see D1015 Western Champion and the 2 steamers Oliver Cromwell and Tangmere. Nunny Castle had failed 2 days earlier and therefore Tangmere was brought down and ran from Bristol to Par and then back to Bristol. Pictures show D1015 standing in between Platforms 4 and 5 at Plymouth and the other of Tangmere leading the double header back to Bristol. The full video will be available on youtube in the near future. Was great to see some 'proper' trains on the line!! After a spell away from the depot 34812 has returned to Torpoint and was seen out and about today on the 81. She has been having repair work done in Plymouth over the last week though had been brought back to the depot early this morning. 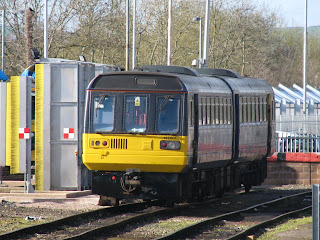 This week's picture is of Pacer, 142001, obviously the very first Pacer produced. Though many have rejected the Pacer I must say it still charms me. Unlike the 150s and 153s I feel these have that bit more character to them. Also they arn't boring like the 150/3s these are all slightly different in there own way and the way the unit acts is just that bit more interesting in my opinion. She is pictured here in the sidings at Exeter St Davids. 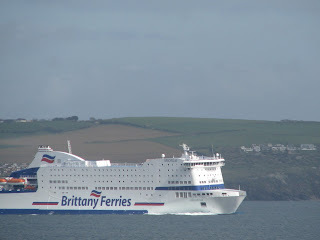 While we are on the subject of Brittany Ferries, while reading about Pont L'Abbe today I found that she was featured in BBC motoring program, Top Gear. She is in shot for literally half a second but that has got to be her claim to fame! Picture above shows James May and Richard Hammond boarding their boat with what was then known as Duke of Scandinavia in the background. Lovely to see! 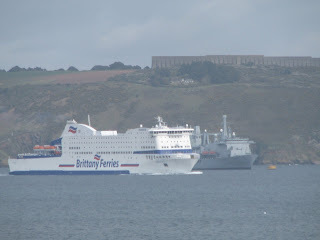 Apparently she was also featured in "Birds of a Feather"
As promised I have finally got a proper picture of Brittany Ferries' Amorique. Right on schedule as well as I said I would in the holidays. And gazing out the window today, what came out, but Amorique. My first chance to see her in her full glory and well I think the looks may take a little bit of getting used to in my eyes. Pont Aven is a sleek and modern design so was an instant hit with me. And Pont L'Abbe was so quirky you had to love it. But this isn't really either of those. I preferred it in the dark!! 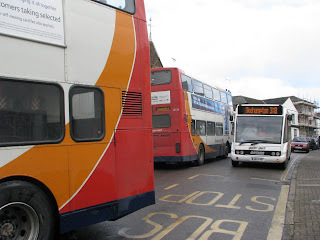 This Friday I saw 3 route branded buses operating the wrong routes and one the day before. It really does make you think why they bother sometimes. Listed are what I have seen over the past 2 days. Today was Tavi-Linx Branded 40582 seen on the Ugobus route 3 to Barne Barton. This was seen several times througout the day on this route where it should be operating an 83/4/6. 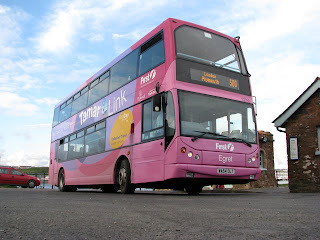 Torpoint's Dennis Trident 32760, in the Tamar Link livery was seen operaring what the bus above should have been doing! 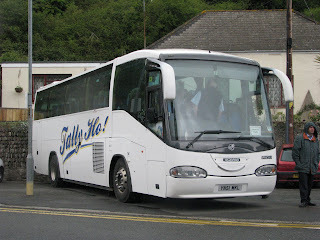 She was seen in Yelverton operating an 83 to Tavistock!! Quite a few miles from home it must be said! This picture shows 32709 branded for the X80 in use on the 93 which it saw use today on! Though following literally right behind it was the bus in the picture below. 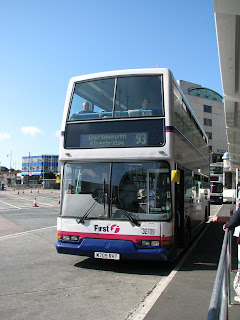 A Mayflower Link 93 Dennis Trident seen on the X80!! Why were they both on the wrong routes and why didn't they swap!! More news to come in my 2 weeks off! Should bring plenty of interesting news!